What do humans really know about that most fundamental question, the origin and evolution of life? Given the grip religion has had on our species for thousands of years, it is a wonder that we know anything at all. Yet a very small group of us interested in verifiable truth has made tremendous headway in discovering answers to this question. This work is broad, complex, and still incomplete, so the masses take little interest. Most of humanity remains ignorant of the beautiful relationships contained in this new knowledge that allows it to coalesce into a picture of the universe so much more fascinating than anything we could have imagined. 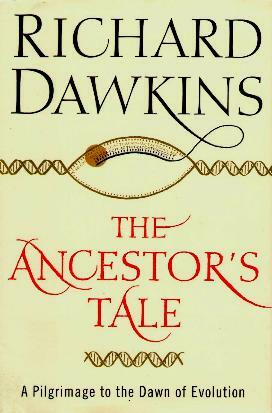 The Ancestor's Tale, by Richard Dawkins, summarizes with elegant skill what intelligent men have learned studying seemingly unrelated areas of science, only to find their discoveries leading to the placement of another piece in the puzzle of explaining life. Mr. Dawkins escorts the reader step-by-step down the evolutionary ladder back into the depths of time unimaginable, with stops at each rung to hear the tale of another form of life that tells us something about ourselves. Along the way, I find answers to other questions I forgot I had: Why did human ancestors lose their body hair? Why did they change to walk on two legs? Why does the platypus have that funny duckbill? How do we know how old things are? How do we know the continents were once all joined together? How do fossils, nuclear decay, embryonic development, and gene sequences help us reconstruct our past? Given the progression from molecules to viruses, what differentiates living from non-living matter? And new questions arise: If all surface life on our planet were destroyed, what kind of life would evolve from the bizarre life chemistry found at the oceanic rifts? Did this life, driven not by the sun but by the heat of the Earth's core, arise independently of the surface life we know? I thought I was an educated person, but reading this book is like attending university all over again. I come away from the experience feeling an amazing grace, not only because of my connections to all other living things, but because I once "was blind, but now I see." Review by Hugh Martin. Conclusion - For the inqusitive mind wanting to understand more about how life works, this book is a gem.